RUSH: No, I will not tour the Foxconn — well, I might tour Foxconn, but it’s not gonna be open for a few years here. I don’t know. I might. I might tour. I haven’t even thought about it. Foxconn, have you seen the details of that? I mean, it’s amazing what’s gonna happen in southeastern Wisconsin. Foxconn manufactures the iPhone for the most part. There are three different manufacturers that assemble the iPhone. Foxconn, Hon Hai Precision company does the majority. Pegatron and Wistron are the other two that assemble the iPhone. You ever stop to think how many iPhones Apple has to make a day to sell 80 million in a quarter? They’ve run the numbers down to the number of iPhones per second that have to roll off the assembly line, and it’s like 800,000 iPhones a second, if they’re gonna make enough of them to sell 80 million in a quarter. It’s astounding, the numbers are astounding. 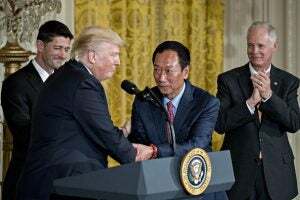 They’re gonna make LCD displays at Foxconn in Wisconsin, not iPhones. The LCD displays will be for computers, TV sets, dashboard in your car displays. That’s what they’re gonna make.